This app encourages the user to fit in a quick workout when the user has a few minutes to spare. On Apple Watch, this app prompts the user to specify how many minutes are available for the workout. The the Misfit app leads the user through a series of exercises designed to work the body hard given the period of time. Animated diagrams accompany the exercises, so the chances of failing to understand what the user is supposed to be doing are rather low. More prosaically (arguably even more usefully) Apple Watch can remind you through this app to take your medications on time, and enable you to mark each dose as having been taken. The WebMD app enables users to use Apple Watch to track when they should be taking medications and when they actually take them. Users can use the Medication Reminders feature in the iPhone app to specify the details of the medications, dosages and times. User can display their medication schedule on Apple Watch and view what medication they are due to take. Users can receive reminders at the appropriate times. When they take a medication, they can tap Take to log the fact that they have taken the medication. The full name of this app says all you need to know: Medisafe Medication Reminder and Pill Organizer. This app has been designed to help you remember to take your medications at the right times and in the right amounts. You enter the data of the meds on iPhone (name of the meds, dosage, timing). Next, the MediSafe app on Apple Watch reminds you what to take at which moment. The app can also alert your Med-Friends when you forget to take your pills. Well, you can certainly guessed what the Running for Weight Loss app has been designed for. It really helps you lose weight by running, This app is a program of interval-training workouts that combine walking, running, sprinting. This app can be used for either indoor running or outdoor running, For outdoor running, users can access GPS running maps to keep them on track. Workouts can be edited manually. Users can also set up their running entertainment – audio books, podcasts, music – from within the app. The free version the Running for Weight Loss app has a barrage of ads. This approach encourages user to pay for premium membership. The Strava app is a running and cycling app. The first time you run this app on your iPhone, you should choose your primary activity – Cycling or Running. Of course, you can switch between the sports. Strava can record your time and distances. The Strava Glance can be displayed in Glances to give the user quick access to the current status. As it happens, the basic version of Strava is free. To get the most out of the app, you’ll need to upgrade to the Premium version, which includes many new features, such as Real-Time Segments which compares your times over particular segments of the ride or run with the time of other Strava users. The Runmeter app tracks the progress of your workout. It works for running, cycling, skating, skiing, and other foot-propelled exercises and activities. On Apple Watch, you can set up a workout, start it, record lap times; you can end the workout tracking after you have finished the workout. The app enables you to track your heart rate, your pace, speed, power, step cadence. It plays, if you want it, motivational announcements to help you persist with the hard work. A nice app that has been designed to help you exercise vigorously in just 7 minutes. It leads the user through a series of twelve high-intensity exercises, that can be performed almost anywhere. The app prompts you by voice to push-ups, jumping jacks, step-ups without equipment or with minimal equipment. Each exercise takes 30 seconds. You get 10 seconds of rest between each exercise. 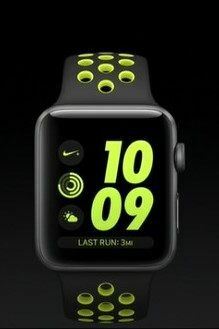 You can view clear graphics of each exercise on Apple Watch screen, and this feature is very useful, as it eliminates any confusion or excuse you may have. Seven integrates with Apple’s HealthKit. Thus the user can review his or her workouts in the Health app. The app helps users to perform strength-training workouts using Apple Watch and iPhone. The body-Pro app includes more than 30 preset strength workouts, plus a metronome and tiers to help people keep their exercises on track. On iPhone, the user can choose the workout he or she wants to perform. It is also possible to customize the exercises, repetitions, weights, rest periods. Then the user can start the workout. With the app running on iPhone, users can control the workout on Apple Watch. They can change the tempo of the workout if needed, and they can mark each exercise as complete when they finish the exercise. The FitNet app provides hundreds of workouts. They range from strength to yoga, from kettle-bells to cardio… Many of these workouts are free, but for many other you’ll have to pay. With FitNet on iPhone, you can control this app from Apple Watch, as it enables you to direct your workout from your wrist. The FitNet app can also share your fitness data with the Health app on iPhone. If you interconnect them, you’ll be able to review and analyze your FitNet workouts in the Health app. This app helps you to inflict hard workouts on yourself using iPhone and Apple Watch. The Tabata protocol helps you alternate short periods of intense activity with even shorter periods of recovery. You can alternate short periods of activity (say, a cycle of ten repetitions of 20 seconds each followed by 10 seconds of recovery. On iPhone, the Intervals app allows to set up any number of different interval-based workouts. The user selects then the workout he or she wants either on iPhone or on Apple Watch. The device keeps the user on track with timers and sounds. With this app users can target their abdominal to get a clearly defined “six-pack” of muscles. On the iPhone, the app provides high-definition workout videos, avatar trainers, training plans, music pacs, tips and more. On Apple watch the Runtastic Six Pack app gets right down to business: as it shows the user the exercises the midsection needs and helps the user log the workouts. This is a free timer app which helps you to work with High Intensity Interval Training (HIIT for short) and Tabata. On Apple Watch, choose the number of sets and the set duration, then tap Start. On iPhone, you can customize the Chronofit app using the set numbers and duration that you need. The Chronofit app provides a stopwatch to make it easy to time events. The Pocket Yoga app gives you an easy way to practice various yoga workouts using the iPhone and Apple Watch. You can use many options, such as the number of repetitions, the duration of the workout or the difficulty of the exercise. The Pocket Yoga app can choose among environments such as Home, Office or Studio. You can turn on or off music and voice. You can also choose whether to share the data generated during your workouts with the Health app. Apple Watch shows you easy-to-understand diagrams of the poses to hold. You can view on Apple Watch when pause and resume playback; you can monitor the progress you make through the workout. This app guides you through various yoga workouts. On iPhone, the FitStar yoga, it sets the duration of the workout, the difficulty, the poses. It uses high-definition video to demonstrate the poses. It just enables you to fit in a yoga workout anywhere a space allows to lay down a mat. Yoga sessions can be customized to make them suitable for your goals and your body. On Apple Watch, the FitStar Yoga app allows the user to control a playback of a session and monitor the progress. The basic level of the FreeStar Yoga app is free. To access more content, you must buy the Premium level. You can use this app to track and record your performance in running, cycling or hiking. Like other similar apps, the WeatherRun app displays your route, speed, distance achieved, duration of your workout. The app retrieves the barometric pressure information from iPhone, so it can display the current conditions and altitude. The app gets local weather statistics from the Internet, so it can add the temperature, the humidity, the wind duration and speed. The WeatherRun monitors your heart rate via Apple Watch. All of this adds up to comprehensive information about your workouts. If your eyes are on other devices and you look for good hands to adopt your old Apple Watch, contact us, and we’ll give you the best price for your watch. Free instant quote, free and fully insured shipping. Fast and secure payment. Don’t wait! Sell your Apple Watch now to iGotOffer!